We have a few days between Christmas and New Year to take it easy. Then I've got to get to work on gathering all our information to go visit the tax man, and Homer gets work done for others while preparing for talks he is scheduled to give in January/February. So we are hanging out on the farm, reading, drawing, thinking. Planning vegetable varieties to plant. Working on getting bids on solar panels. Scheduling meetings to talk about next growing season, and where our items will be. But for now, we are eating like royalty. Every day we are eating from things we canned, froze, or are still growing in the hoophouse or under floating row covers. Yesterday it was eggs poached in spicy tomato sauce..all from our farm. Today, chicken and dumplings..our chicken, Everblossom Farm carrots and the last of their onions and garlic, Yee Haw Farm flour for the dumplings. Each brought tears to my eyes, they were so clean and delicious tasting. 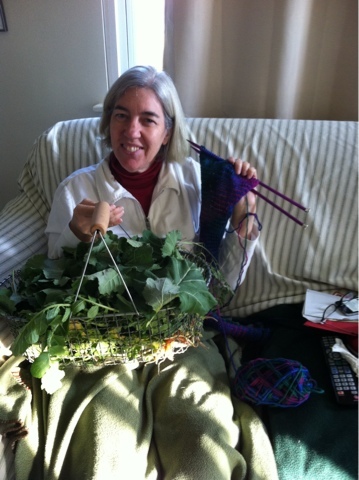 There is a little knitting going on too. And most days Homer picks collards, carrots and daikons. After getting garlic and onions brown in a pan, he slices the greens and shaves the carrots and daikons in there, and in just a few minutes we eat the sweetest, most delicious dish. Incredible how tasty such a simple dish can be. We are almost out if collards and the kale and Swiss chard are too small to eat. Darn it. Will have to eat salad!